"Less is More": Week 99-100 Recipe! You can choose tea, coffee, water, sodas, alcohol of course if you wish, in fact any drink at all... but all of us...Chrissie, Mandi and Jen would like to wish all of you a very Happy Christmas and a prosperous and healthy New Year. For my first card this week I have used a simple Pink Petticoat image from the Happily Ever After set and simple coloured in the hearts with a red pro-marker and added some glamour dust into each glass to look like bubbly... The sentiment was added in word. I have them mounted onto red pearl card base... Nice and simple..
For my second card it's more signature me with the stitching and the kraft card stock. The sentiment and image are from Paper Smooches Cyber Cafe set. I have used whisper white ink pad for the steam and cocoa memento ink for the sentiment and cup. The cup is then mounted on a couple of foam pads. I've done a little rough stitching around the edges and mounted onto kraft card. 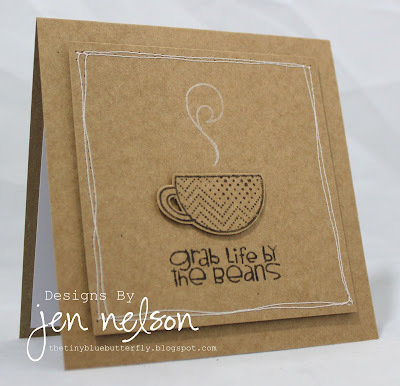 This card is made totally with Stampin' Up products (apart from the cardstock that is). The stamp set is Tea Shoppe, stamped with Wisteria Wonder ink, the small pansy stamp being coloured using SU markers. The sentiment was punched using the Modern Label punch. The embossing was done with the Manhattan Flower Folder. The glass is from the Cheers to You set and the sentiment (carefully placed to flow on from the cocktail stick, using my Lego positioner) is from the Wonderful Words set, both of which I believe are now retired. 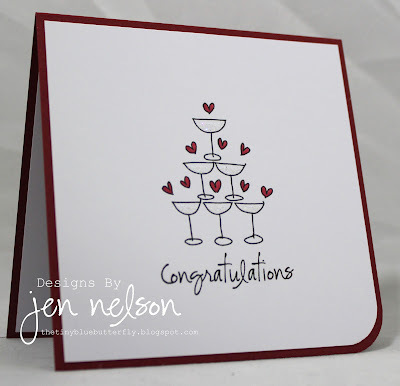 I have a few more drinky type cards on my personal blog and I'd love you to pop by and see the others I have done there. We are lucky enough to have our lovely grandson Joe here, with his mummy and daddy too! Will certainly be a lovely Christmas. Back section is wallpapered in a beige and ivory damask. Excuse the mess on the floor! Work in progress, but, the horrid big ugly counter has gone! Our sideboard from our lounge Much more useful in the shop! Merry Christmas to all, have a nice hollidays-great challenge. @all I wish you Merry Christmas and a Happy New Year. Beautiful examples as always ladies, will be next week before I can contribute. Great to see what Mandi is up to as well. I've no card again this week either, since becoming the Director of Hospice's Celebrate-A-Life, I never have time to play in the month of December but I did want to drop round and wish all the wonderful folks at LIM, a very "Merry Christmas." Mandi, the shop looks fab and congratulations on fulfilling your dream. Fun challenge -- Mandi your shop is shaping up fabulously! Merry Christmas to all of you! Haven't popped in in a while, just wishing you ALL a Happy Christmas and a Wonderful New Year. So glad your shop came to fuition Mandi and it looks wonderful, wishing you great success. I would like to raise a glass and wish Chrissie, Jen, Mandi (fabby shop) a and all the Limettes a Happy Christmas and a happy and healthy 2013. Hope everyone had a joyous Christmas and that your New Year rings in health, Happy, and full of new hope. Thanks for sharing all the lovely artwork. Very beautiful. I will be back to peek in from time to time. Stopping by to wish everyone the best for 2013 and to thank Chrissi, Mandi and now Jen for such fab challenges since this blog started - Saturday challenges are a must now!